I’ve been under the weather over the last few days with a fun little virus making it’s way around our household. I made this goat cheese just before the bug attacked me, but wasn’t able to find the motivation to write a blog post. Also, Don’t be surprised if my posts are a little erratic over the next 3 months, as the busy season in my shop is underway, and I’ve begun working more hours. So, on to making goat cheese! It’s not all that difficult, and can be made using standard kitchen equipment. 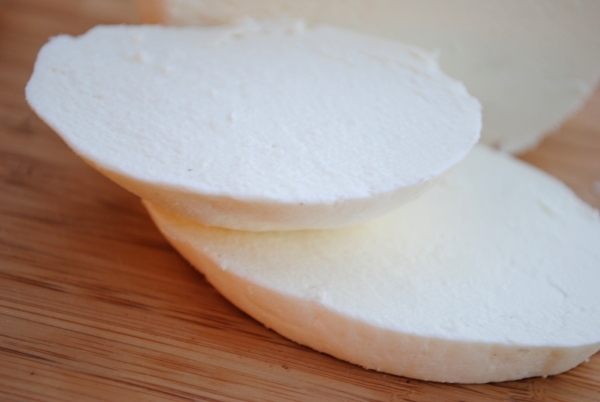 If you’re interested in making goat cheese, I’m assuming you have access to some goat milk. The only things you will probably need to pick up are chèvre culture and some butter muslin. Both can be purchased at New England Cheesemaking Supply. In fact, I just placed an order for more chèvre culture, butter muslin, and yogurt culture, so at the end of this post I’ll give away some culture and muslin. I do have some special little molds for making chèvre in a traditional shape, but I find the butter muslin to be more practical. I save the molds for making cheese for special occasions. I used to raise my own small herd of Toggenburg dairy goats. Unfortunately, life circumstances required me to sell my goats a few years ago. However, I have a good friend who has been raising Toggs for more than 35 years, and she and I trade milk for my husband’s maple syrup. I miss my goats, and I hope that maybe some day they will fit back into my life. Let’s begin with goat milk. 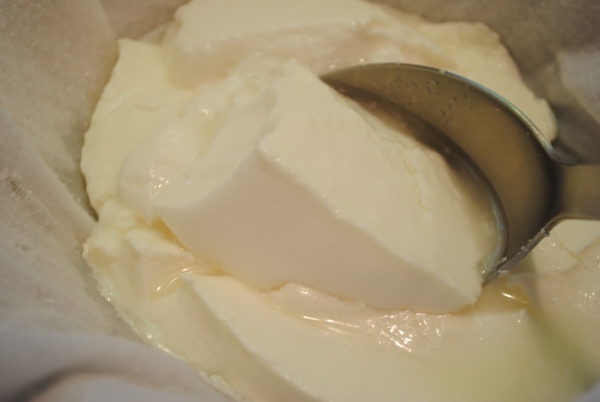 The finished quality of the cheese depends entirely on the quality of the milk. High quality milk comes from healthy, well fed animals kept in a healthy environment. Milking should take place in a clean environment and should be cooled as quickly as possible. The choice to use pasteurized or unpasteurized will be yours. Personally, because the milk I use is not tested, I use the flash method of pasteurization, heating the milk to 160°F for 15 seconds. Begin by placing 1 to 2 gallons of milk in a large pot and bringing the temperature to 72°F to 80°F. I do this by placing my pot in a sink full of hot water, stirring occasionally and checking the temperature with my meat thermometer. 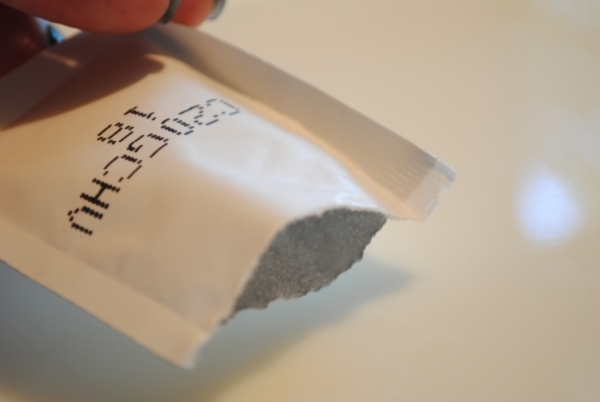 Once the milk reaches the appropriate temperature, sprinkle a packet of chèvre culture over the surface of the milk and stir until mixed thoroughly. Cover the milk and allow it to sit undisturbed at room temperature for 24 hours, or until the milk is firmly set. 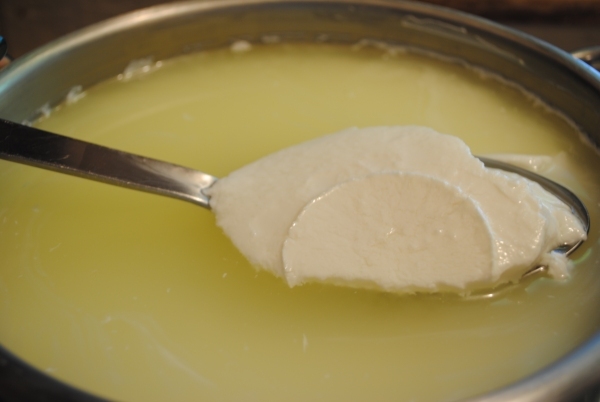 When it is ready the curd will separate from the whey and it should look something like this. Ladle the curd into a colander lined with butter muslin. Next, take the four corners of the muslin and tie them together with a couple of solid knots. 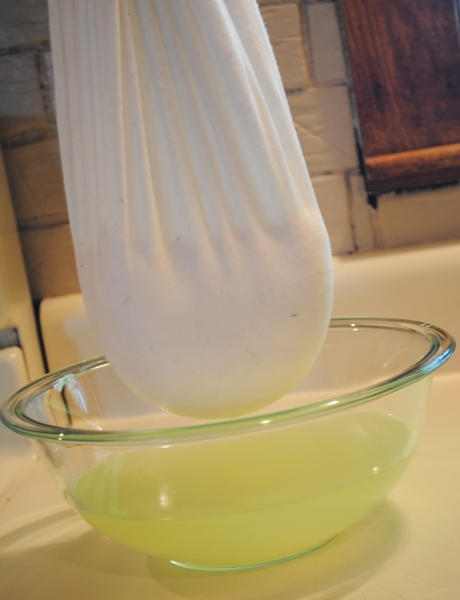 Hang the cheese over an empty bowl to allow the whey to drain for 6 – 12 hours. I usually start my cheese making in the evening after dinner. Then when it’s time to drain the cheese, I let it hang overnight, and it’s ready the next morning. I’ll describe my draining set up, but you may want to figure something different. I use big “S” hooks. I put one end of the hook through the knot of my muslin and hang the whole thing by the other end of the hook from a knob on one of my kitchen cabinets. Now for the giveaway. I will give away one 5 pack of chèvre culture and a two yard length of reusable cotton butter muslin. Leave a comment at the bottom of this post and I’ll draw from the names. Deadline to enter your comment is this Friday evening, September 10 at 8 PM.